Need help guiding your girl into a grownup? 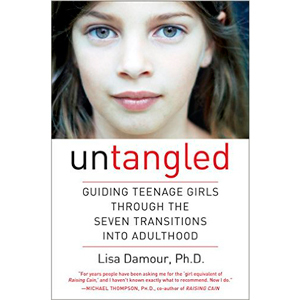 Untangled by Lisa Damour argues there are predictable patterns when it comes to our daughters’ development. She believes, “Life with your teenage daughter doesn’t have to feel like a tangled mess.” Based on her experiences as the director of the internationally renowned Laurel School’s Center for Research on Girls, Damour outlines the seven transitions girls experience as they move into adulthood in her new book. Harnessing Emotions: “Parents who are surprised by their daughter’s dramatic ups and downs can lose sight of the fact that she is pretty shocked, too,” Damour explains. I particularly like this section of Untangled for it distinguishes the difference between complaining, which implies someone else should fix things, and venting, which serves as a means for unloading distress. Damour encourages parents to compare it to an adult grumbling about work during dinner. If someone who cares about you hears you out, you often feel better. That’s all your teenager needs. Contending with Adult Authority: Damour compares this step to seeing behind the curtain in the Wizard of Oz. She reminds parents that the goal isn’t to raise a sheep, who follows any adult. The ability to evaluate authority figures is essential for future success. Damour maintains, “Teens watch adults closely and soon notice that many of our edicts are, in fact, hypocritical, nonsensical, or simply self-serving.” Therefore, your teenager is likely to test your arbitrary rules. That’s not to say teens don’t need boundaries because they do, but Damour encourages parents to assess and acknowledge their limitations. It will make for a better relationship with your teen. Planning for the Future: Throughout Untangled, Damour offers good advice for negotiating technology, but I really liked her explanation of how our teenagers are about to create a digital record of their adolescence. No one is expecting perfection. “Put the emphasis where it belongs,” Damour recommends, “On your role as her ally in the effort to ensure that none of her regrettable impulses follow her indefinitely.” And seek help from older teens with experience in such matters for greater impact. Entering the Romantic World: In this chapter, Damour tries to help parents make the most of be limited opportunities to guide their daughters through the complex world of romance since most girls can be intensely private about such matters. Damour’s advice, “[Remember] you have three jobs: to alert your daughter to the fact that she has an inner compass, to support her in asking for what she wants, and to make sure she knows how to express what she doesn’t want.” She explains that part of the problem is that many parents don’t know how they feel about teenage relationships so, once again, getting a handle on your own emotions will help you handle your daughter’s. Untangled offers a host of wonderful suggestions for dealing with social media, sleep patterns, drinking, and drugs. Arguing about school work? There’s advice on that and embracing the growth mindset too. If you want insights into your growing girl so you can raise a healthy and happy young woman, then check out Untangled by Lisa Damour. It’s filled with great information on how to connect with your daughter.